The Fifth Seal is a powerfully disturbing Hungarian film directed by Zoltán Fábri, based on a novel of the same name by Ferenc Sánta. 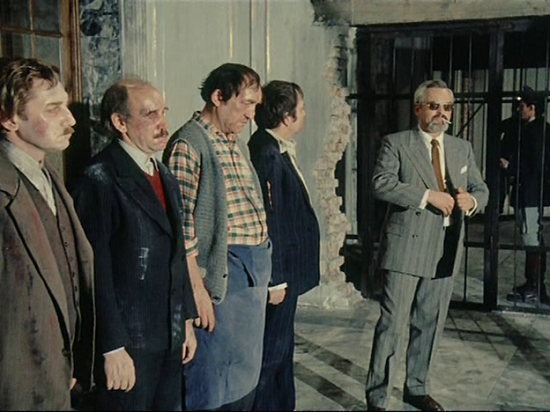 It won the Golden Prize at the 1977 Moscow International Film Festival. What makes a great film? Can a film show us a time in history when unspeakable events happened and still be considered a "great" film? Is there such thing as a movie being too truthful? Can films cross a line of reality and be seen as too realistic? The movie makes you ask yourself difficult questions and think about life and its values in a way we rarely think. It's so beautifully done and acted - that at no point do we feel anything artificial: this is a piece of life and a deep philosophical fable at the same time. Set in Budapest in 1944 towards the end of the Second World War, it tells the story of a group of friends, Miklós (Lajos Öze) a watchmaker, László (László Márkus) a book seller, János (Sándor Horváth) a carpenter, and Béla (Ferenc Bencze) a barkeep. 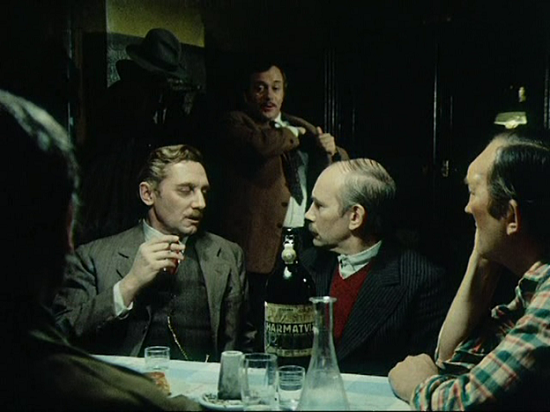 They hang out in the dim light of Béla's establishment, drinking, smoking and telling tales. 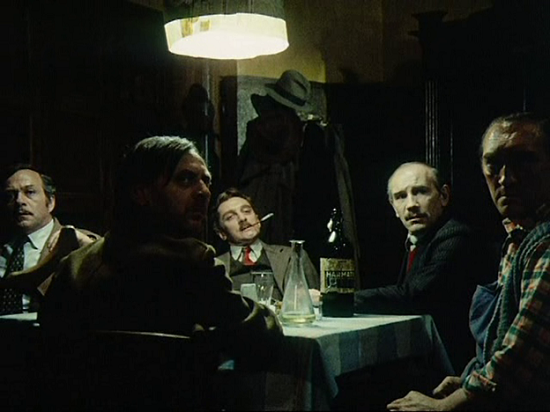 One day a fifth man (István Dégi) joins their table and unbeknownst to them all, an innocent hypothetical question will change their lives forever. They sit and talk, engaging in everyday subjects. But one of them tells a serious story. Pretend you are about to die but you will be reincarnated into one of the two people; a slave or a slave-owner. The slave suffered harshly under the slave-owner. He had his tongue cut off, had his wife and child killed and one of his eyes removed. But, he still goes on living because he tells himself that he is a good person, because at least he has never committed terrible, violent acts. On the other hand, the slave-owner goes through no moral crisis. He doesn't see his actions as being wrong. So the men are left with the choice of whether to be poor and noble or wealthy and corrupt. So the underlying question that the film deals with is a philosophical one. Given the choice, would you rather be reincarnated as a vicious and evil tyrant who commits terrible acts, or a good and noble slave who suffers through life? A choice that these four men ultimately face when they are arrested, imprisoned, and tortured for no apparent reason; and one that makes the viewer ponder about themselves and humanity as a whole. As mentioned earlier, the acting is very natural and realistic, and it soon becomes evident that these are just regular Joes having fun, living their lives, trying not to draw any attention to themselves, while living under a fascist dictatorship; and despite whatever cultural background you are from, it’s difficult not to relate to these guys in some way. If you like movies that raise philosophical questions , films that potray the ever present dark forces around us and want to see how a serene moment can suddenly turn sinister, see "The Fifth Seal". This impression and this memory last a lifetime, unlike most of one-day sensations we waste our time and money on. The film the 5th seal was really haunting.Your write up touch the spirit and enigma the film contained. Your style of writing is easy and direct. Also liked the 100 films you selected,especially because it included otherwise eclipsed wonderful film AMELIE.